Want to take the apple of your eye, your main squeeze, your “ku’uipo,” or “sweetheart,” out to a romantic Valentine’s Day dinner? 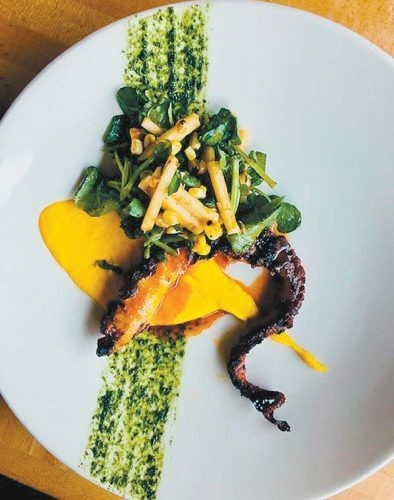 Maui chefs aim to please with a tantalizing array of dinner options. 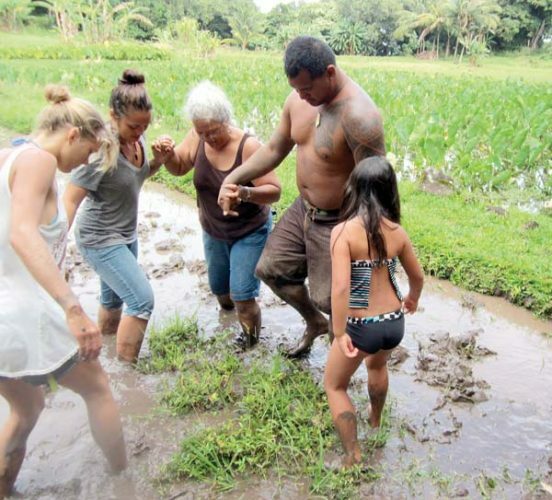 Here are some of Maui Scene’s favorites listed by geographical areas of the island. Hyatt Regency Maui Resort & Spa in Kaanapali will present passionate options at its various outlets. Couples may indulge in mouthwatering a la carte specials at Japengo such as the Lover’s Shooter with an oyster, uni, quail egg, daikon, chili radish, green onion, sake, ponzu and sesame oil. Special entrees include the wok-fired and grilled Hokkaido scallops with uni-dynamite topping and Hamakua mushroom risotto, bacon, lobster, tatsoi and lemon zest; or lavender-braised Osso Buco with shiso gremolata, “loaded” mashed potatoes and roasted local tomato demi glace. Dessert is decadence chocolate tart with sea salt caramel, coconut anglaise and chocolate dipped strawberries. Dinner hours are 5:30 to 9:30 p.m. For reservations, call Japengo at 667-4727. The second Hyatt Maui choice is Romance Tour of the Stars at 10 p.m. For a fitting finale for Valentine’s Day, couples can share champagne and chocolate-covered strawberries during the “adults only” Tour of the Stars” on the resort’s rooftop. It’s a special opportunity to learn about the night sky while overlooking the Pacific Ocean and Neighbor Islands. Director of Astronomy Eddie Mahoney leads the tour and identifies thousands of objects in the sky including stars, planets, galaxies and nebulae. Couples will first learn to interpret it all with the unaided eye just as the ancient voyaging Polynesians did 1,000 years ago, then with giant astronomy binoculars, and a telescope called “The Edge.” Cost is $40 per Hyatt guest and $45 for the general public. Call 661-1234. The iconic Ka’anapali Beach Hotel wants you to get in the Valentine’s Day groove and celebrate with someone you love over a buffet dinner from 5 to 9 p.m. Wednesday. 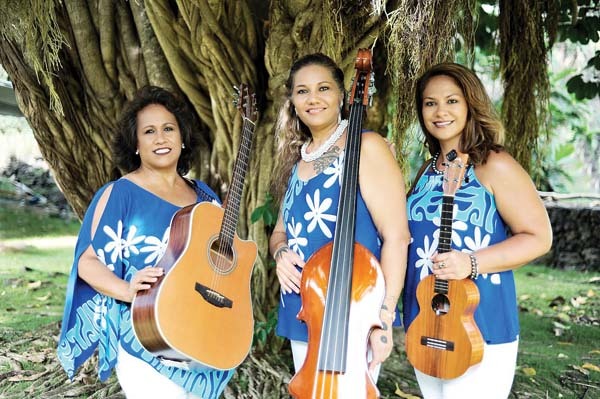 It will include Hawaiian entertainment throughout, a glass of house wine or champagne, a complimentary rose for each lady and a hula show from 6:30 to 7:30 p.m. The buffet menu by Executive Chef Tom Muromoto will offer fresh picks of raw kale salad; smokey bacon and peas; cucumber and pohole fern shoots; Asian pear and walnut salad; and an array of sushi. The entree choices are award-winning Ko’ala lamb chops; kiawe-roasted prime rib; misoyaki-seared salmon; stuffed roasted chicken breast; and lobster, scallop and shrimp Newburg. For dessert, delight in green-tea creme brulee, chocolate-dipped strawberries and tiramisu. Cost is $65 per person and $45 for children 6 to 12 years of age. Call KBH at 667-0124. 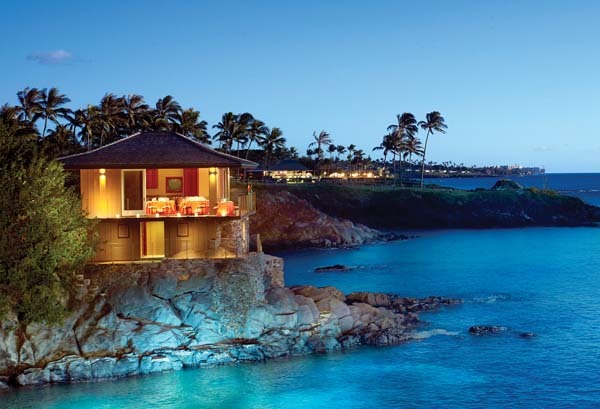 The Ritz-Carlton, Kapalua will be puttin’ on, four, count ’em, Valentine’s Day dining options. From 6:30 to 10:30 a.m. Wednesday, wake up to endless mimosas and an-all-you-can-eat gourmet breakfast buffet at The Terrace. Cost is $40 per person. Valentine’s Day dinner at The Banyan Tree will let you celebrate on this special night with a four-course menu with two seatings at 5 and 8 p.m. Start with an amuse bouche of lavosh with Vermont goat-cheese butter; followed by your choice of seared scallop with mascarpone polenta; crispy Haiku avocado katsu or crispy 5-spice duck bun. The next course choices are foie-gras panzanella salad with wild arugula, creamy artichoke bisque; or salmon and Kona kampachi carpaccio. The main courses are candied-orange sweet-yam risotto with half Kona lobster; steamed Hawaiian snapper or 20-ounce tomahawk ribeye for two. 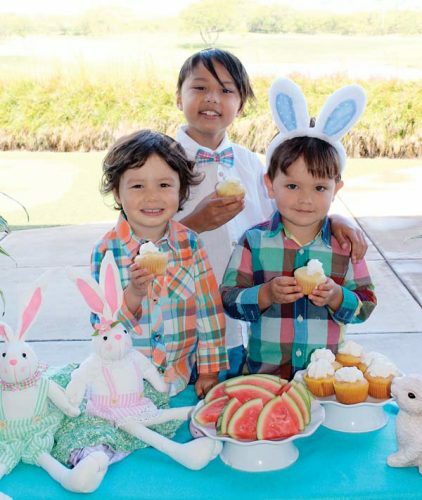 The cost is $138 per adult and $39 per keiki. Add on trips to the Dessert Lounge and a split glass of rose Moet Chandon champagne for $48 per person. Other Valentine’s Day food promotions at the Ritz will be at Alaloa Lounge sushi action station, oyster display and champagne specials from 4 to 9 p.m.
Oceanfront and super casual, the Ritz’s The Burger Shack will feature a smokin’ hot Maui Cattle Co. beef burger with jalapenos, cheddar cheese, tempura shrimp and chipotle aioli and the Strawberry Bliss shake from 11:30 a.m. to 4 p.m. For reservations at any of these outlets, call the Ritz at 665-7089. Typically closed on Wednesdays, Pulehu, an Italian Grill at Westin Kaanapali Ocean Resort Villas will be open with special hours from 5:30 to 9:30 p.m. on Valentine’s Day to debut Taste the Stars. The intimate five-course dinner is in a tranquil garden and includes a champagne toast of vintage Dom Perignon. A second, three-course prix-fixe Valentine’s dinner option will also be available in the main dining room. Taste the Stars is a menu created by Chef de Cuisine Jesse Pita, accompanied by a curated assortment of fine wines as pairings. Courses include Caprese salad with local tomatoes and fresh burrata cheese; pan-fried gnocchi Genovese; and porcini-dusted ribeye with seasonal Maui vegetables and mushroom risotto. Chef Pita’s gluten-free chocolate olive oil cake will be served with a duo of gelatos in Amarena cherry and marshmallow flavors. Seating times are at sunset. The cost is $120 per person. As for the other option, it costs $65 per person. Call 667-3254. Tucked off of Dickenson Street away from the hustle and bustle of Front Street, Lahaina Coolers is an intimate hideaway for locals and tourists. Look for the blue-striped marlin, a massive trophy strung from the ceiling, and perfect for photo ops. Open at 8 a.m., Lahaina Coolers serves food to midnight and stays open until 2 a.m. for cocktails. Dinner entrees that always appeal are sizzling shrimp with garlic; Evil Jungle pasta with chicken, peppers and peanut sauce on linguine; and bone-in pork chop laced with Chinese 5-spice marinade. For further details, call 661-7082. The Montage Kapalua Bay resort’s signature Cane & Canoe restaurant will offer a multi-course dinner feast from 5 to 9 p.m. on Valentine’s Day. Begin with an amuse bouche of potato-leek creme with chive truffle oil; followed by choice of big-eye tuna tartare or seared scallops. The main course is your choice of grilled filet mignon, seared Hawaiian snapper or roasted Keahole lobster tail. Desserts range from passion fruit Pavlova or chocolate pot de creme along with mignardises for the table. Cost is $85 per person. Add $45 for wine pairings and $50 for an optional Perigord truffle enhancement. 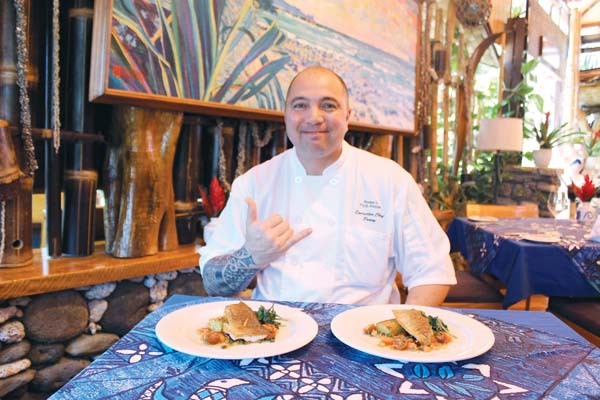 Montage Kapalua Bay Executive Chef Chris Damskey will present a memorable dinner at the Cliff House for $500 per couple. An advance notice of 72 hours is required. Call the Montage at 662-6681. Maui Prime Fine Foods in Emerald Plaza in Lahaina is the one-stop shop in West Maui for fresh oysters, seafood, prime meats, cheeses and wines. 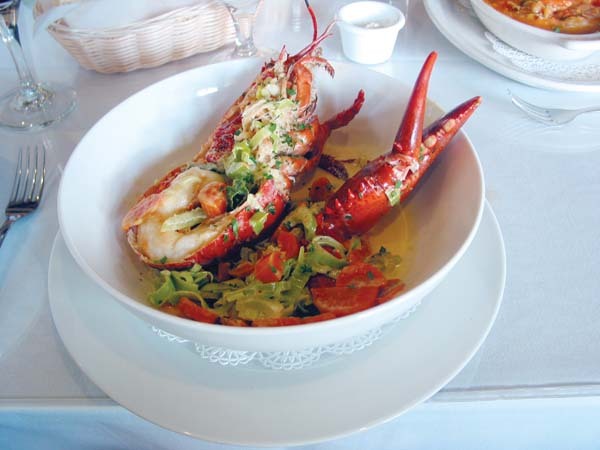 Wow your sweetheart with the steamer pot for two in which you get to keep the pot filled with one lobster or two lobster tails, one pound of clams, six pieces of crab claws and six shrimp, aromatic broth and baguette. Call Maui Prime ahead to ensure the pot is available at 661-4912. 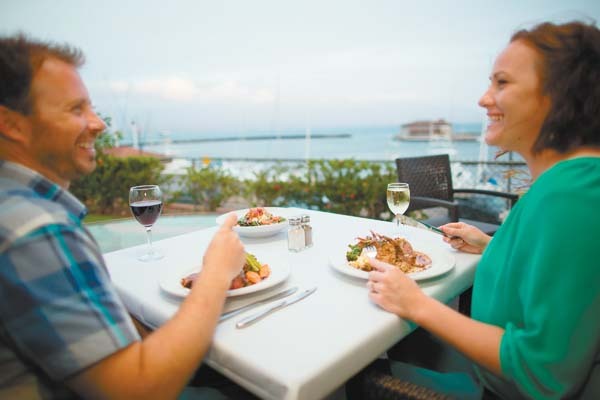 Get cozy at the legendary Sea House at Napili Kai Beach Resort with a la carte specials as well as its its regular dinner menu from 5:30 to 9 p.m. Friday through Valentine’s Day on Feb. 14. Executive Chef Alex Stanislaw will entice you with crab-and-lobster-stuffed crepes, kale and Romaine salad with housemade Green Goddess dressing, lover’s surf ‘n’ turf, Hawaiian fish Oscar, and desserts from chocolate pot de creme to bananas Foster for two in rum butter sauce. The sweetheart’s special of a premium bottle of wine that is ordinarily priced at $110 will be reduced to $75 for those who order the special Sea House Valentine menu offerings. For reservations, call 669-1500. Humuhumunukunukuapua’a at Grand Wailea is as romantic as Maui gets from its thatched-roof island perch in a million-gallon saltwater lagoon overlooking the ocean and Neighbor Islands beyond. Chef de Cuisine Mike Lofaro will woo you with modern Hawaiian seasonal fare in a three-course menu. Cost is $130 per couple and it includes a glass of sparkling wine per person. First course choices range from hamachi carpaccio with Hawaiian chili, celery and ginger shave ice; to Hokkaido scallops with yuzu, radishes and truffle vinaigrette; and to marinated tomatoes with burrata, smoked Kula strawberries and shallot confit. Entree courses are catch of the day with tomato-ginger emulsion; crisp mahimahi with orange-lychee sauce; rack of lamb with salsa verde and New York steak with Maui onion Bordelaise. For dessert, take a “walk” in the Humu chocolate garden, a wonderland of chocolate “stones,” pistachio “moss” and cocoa gelee. Grand Wailea’s Bistro Molokini will get you in the mood for romantic food with a three-course Valentine’s Day dinner menu for $65 per person. Begin with yuzu-cured hamachi, followed by prime beef filet or pan-roasted bone-in Iberico pork chop, and dessert of dark Maniari chocolate mousse. Grand Wailea’s Humuhumu and Bistro Molokini will start serving these dinner specials at 5:30 p.m. Feb. 14. For reservations, call 875-1234. Looking for an intimate hideaway? Cafe del Vino in the Maalaea Harbor Shops will entice you with a four-course Valentine’s Day special that begins with a glass of Coupe de Champagne Royal. Restaurant hours are 4 to 9 p.m. daily, except Sundays. Then enjoy a second course of feuillete, or puff pastry, of mushrooms with Boursin cheese or bruschetta Italian-style made with ciabatta. Caesar salad is next, followed by surf and turf of New York tenderloin with jumbo shrimp or Kona Maine lobster Del Vino. Dessert is your choice of the house selection. Cost is $60 per person. For reservations, call Cafe del Vino at 868-0732. Ruth’s Chris Steak House will celebrate Valentine’s Week starting at 4 p.m. Friday until Feb. 16 at its Wailea and Lahaina locations. Those who dine during this time frame get a $20 gift card. Sip cocktails such as the Roses are Red with Four Roses bourbon, strawberry, lemon and ginger beer; or the Red Sparkle with Tito’s handmade vodka with strawberries and prosecco. Start the night right with sizzling blue crab cakes and oysters Rockefeller. 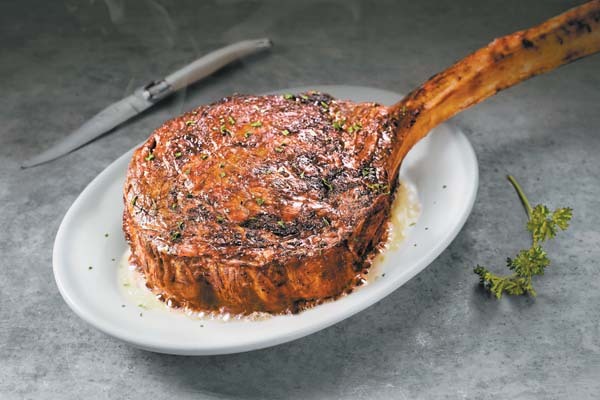 Crunch steak house salad, savor creamed spinach and then saddle up to entree selections from the a la carte menu such as indulgent favorites like filet mignon, New York strip steak, USDA bone-in 40-ounce tomahawk ribeye or the Porterhouse for two. Then indulge in the special chocolate duo cake oozing with ganache. For reservations, call Ruth’s in The Shops at Wailea at 874-8880 or Ruth’s in the Outlets of Maui mall in Lahaina at 661-8815. The perfect place to pop the question or to simply go out for a night on the town is 5 Palms at Mana Kai Resort in Kihei. Whether you dine in the restaurant or out on the lanai, the expansive dining house has stellar views of Keawakapu Beach from every seat. Open for breakfast, lunch and dinner, 5 Palms will offer a special Valentine’s evening menu from 5 to 9 p.m. The cost is $99.95 without wine pairings and $119.95 with nice selections. Begin with Hawaiian Big Eye ahi tartare, Osetra caviar and taro chips; followed by poached spiny lobster over country greens with fines herbs and orange segments drizzled in champagne vinaigrette; entree duo of filet mignon in whole-grain mustard in green-peppercorn brandy reduction with prawn scampi. Dessert is Hawaiian chocolate decadence cake with Grand Marnier, creme Anglaise and chocolate-covered strawberries. For 5 Palms reservations, call 879-2607. 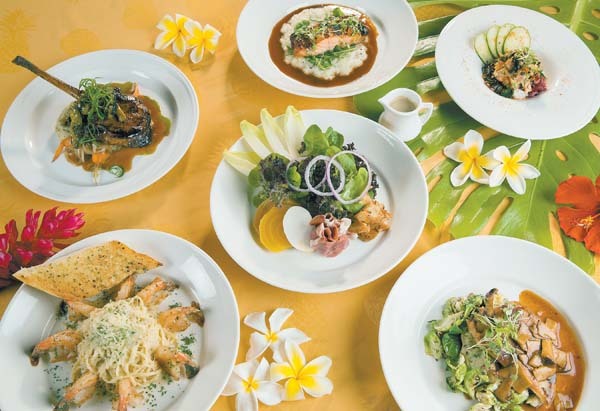 Longhi’s Wailea and Longhi’s Lahaina will offer two different prix-fixe menu options with two different prices on Valentine’s Day. Menu one costs $59 per person and features ahi poke or roasted vegetable crostini, followed by the world-famous Longhi Longhi salad with lemon-feta vinaigrette. Choice of entrees are fresh Hawaiian catch, veal Marsala, rigatoni Bolognese, prawns Venice or vegetarian eggplant parmesan. Dessert is mango cheesecake served with chocolate-covered strawberries. Longhi’s dinner menu option two gives you the same choices of appetizers, salads and desserts as listed above with an entree of filet mignon and Alaskan king crab legs for $80 per person. 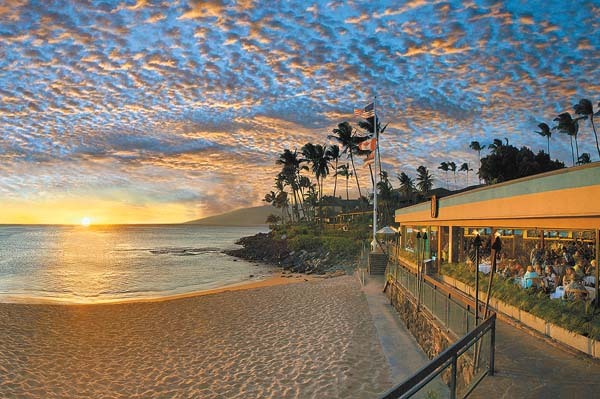 For Longhi’s Wailea reservations, call 891-8883; for Longhi’s Lahaina, call 667-2288. The Shops at Wailea is the place to find the perfect gift for your special someone. Honolulu Cookie Co. will sell its premium boxes of cookies and you may also dine at the above-mentioned Ruth’s Chris Steak House and Longhi’s along with, Cheeseburger Grille & Tap Room, The Pint & Cork and Tommy Bahama Restaurant & Bar, as well as two grab-and-go eateries, Island Gourmet Markets and Whalers General Store. For more details, call 891-6770. Enjoy the a la carte options created by the center’s expert chefs. The appetizer of seafood on ice includes oysters on the half shell, shrimp cocktail, fresh ahi sashimi and island poke. Entrees are fresh catch of the day with harvest spices and vegetables and lasagne roulade stuffed with lobster, crab, mozzarella and spinach over champagne tomato-cream sauce. The appetizer is $24 and entrees range from $35 to market price. Call Seascape Ma’alaea at 270-7068.